Are you tired of wasting countless hours collecting data through the Web? Tired of scrolling down search engine results or Websites, copying, pasting, saving, and starting the whole process over again? A Powerful Tool For Everyone : with simple intuitive features as well as sophisticated scraping functions and data structure recognition, the program covers a broad range of needs, from casual to very specific requirements or very large volumes. Use the built-in RSS feed extractor or, if no feed is available, build your own workflows at the periodicity you want, to extract the latest news from search engines, press sites or from your competitors’ Websites. Let OutWit Hub’s built-in contact extractor grab contact info for you: names, emails, phone numbers, physical addresses from Websites..., or create specific scrapers for directories, rosters, corporate ‘about’ pages, professional profiles etc. Create OutWit Hub macros to regularly check your preferred RFP sources for particular keywords or conditions and save the pertinent ones to your database. Monitor key elements in the source code of whole Websites or lists of Webpages. Count posts, words, images, find dead links, meta data, etc. Grab Job listings, real estate ads, events, flight schedules, etc. with complete reliability by making (or having us make) custom scrapers with exactly the data you want and the layout you want. Explore SERPs, huge lists of links, or of complete Websites, to find images, media, pdf files, Excel spreadsheets and download them to your hard disk or server. OutWit Hub v.7, your all‑purpose Web collection engine. Find, extract and organize all kinds of data and media from online sources. OutWit Hub automatically explores series of pages, search engine results, whole Websites for you and extracts contacts, links, images, data, news, etc. Pro Edition: Powerful, Easy Web Scraping. OutWit Hub dissects Web pages into their different elements. As the program knows how to navigate from page to page in sequences of results, it can automatically extract quantities of information objects and organize them into usable collections. Expert Edition: The Power-User Scraper. For fast, high-volume extractions, complex cases requiring advanced directives or server script automation, the Expert edition includes a wealth of additional functions. Enterprise Edition: High Volume, Multi-User. For very large extractions, running multiple instances or requiring multi-user work, the Enterprise edition is OutWit's top level package. 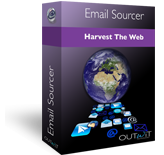 With the simplest of interfaces (Web page at the top, found results at the bottom), Email Sourcer is a contact scraper which automates and vastly simplifies your sourcing tasks. Simply click on the exploration button and have Sourcer do the work for you. The design of the application makes it accessible to anyone. With a single click on the exploration button, you can launch the scraping on hundreds of pages. All Email Sourcer functions are also included in OutWit Hub. Email Sourcer explores Websites for you, automatically looking for email addresses and contact information. The program analyzes the textual content of pages and documents to recognize email addresses, phone numbers, physical addresses and more. Navigating from page to page automatically, it extracts the information and exports it in the most common formats. 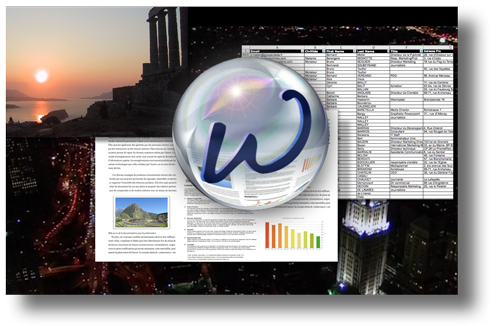 Download OutWit Images and OutWit Docs: they are free. A simple, straight-to-the-point online image browser. Explore the Web for pictures and easily create, save, and share collections. With OutWit Images, you can automatically explore Web pages or search engine results for pictures and create, save and share your collections or view them as full-screen slideshows. With OutWit Docs, you will find all kinds of documents from multiple online sources. Docs is a simple application which explores large series of Web pages or search engine results for you and downloads the files automatically. Ask us for Tailor‑Made scrapers and automated extraction jobs. Give us a URL, tell us which data you wish to extract and we will work on it for you. You'll simply test the extraction and pay if satisfied. If you need help for a difficult extraction or if you simply don't have time to create a scraper yourself, just fill in a simple form describing what you need. We'll exchange with you, asking you for details we may need, and send you an estimate. We'll then create the scrapers or automated jobs for your specific extractions, and send you a limited version for you to test the extraction. If you are satisfied, you send us your payment and we give you the key to unlock the scraper. For a decade now, your feedback has been key to enhancing our products. Each report helps us fix problems of course but, through your remarks, you are also keeping us on track to make the application simpler, more pertinent and more powerful. Don't hesitate to report problems and give your suggestions. We will answer in a matter of hours. Please, be as precise as possible, with example urls and simple reproducible tests: it will help us help you better. All trade marks, brands, logos and Web sites cited in this site are the property of their respective owners. OutWit is not affiliated to any of them.